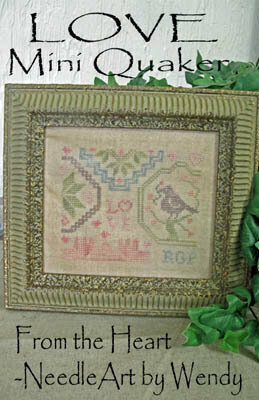 Model stitched over 2 threads on 36 Ct. Olive Leaf linen from Dixie Sampler with Gentle Art Sampler threads. 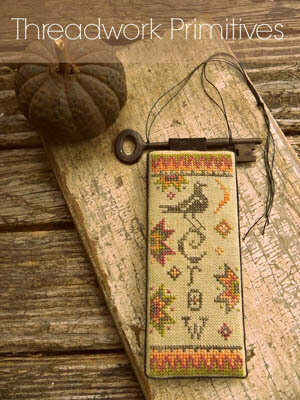 Stitch Count: 60W x 101H Finishing instructions included. 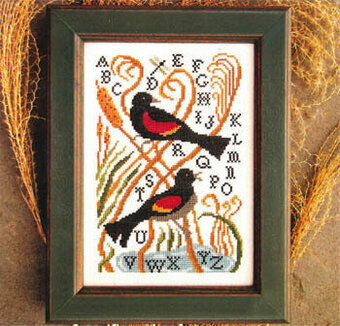 Model stitched on fabric of your choice with any one color of thread. 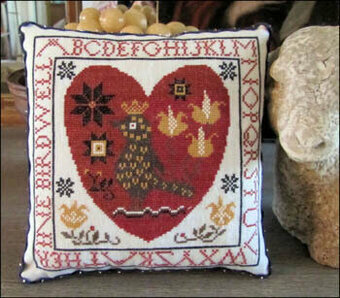 Stitch Count: 341x128. Model stitched over 2 threads on 30 Ct. 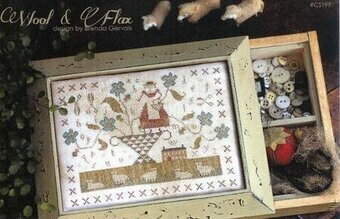 Straw linen with either Gentle Art Sampler threads (cotton) or Needlepoint Inc Silk and Gentle Art's Simply Wool. 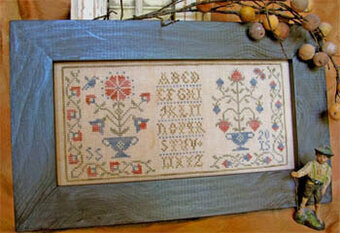 Stitch Count: 345W x 110H. 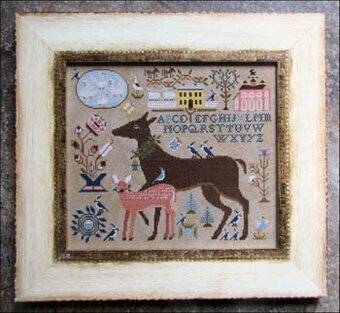 Model stitched on 30 Ct. Parchment linen by Weeks Dye Works with Gentle Art Sampler threads. 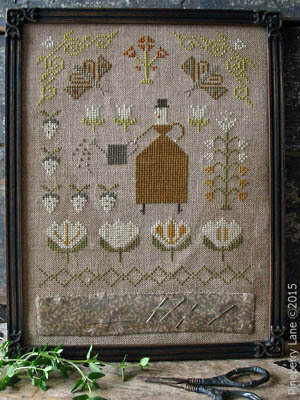 Stitch Count: 61x94. Model stitched over 2 threads on 36 Ct. 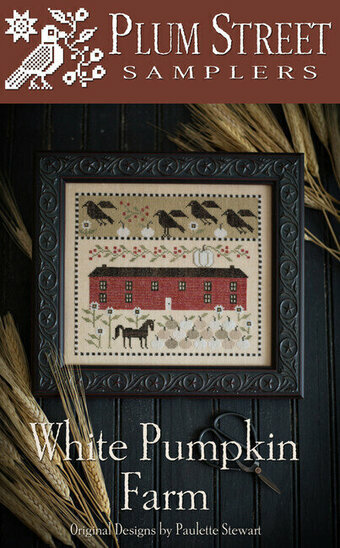 Straw linen by Weeks Dye Works with one strand of Needlepoint Inc Silk (or DMC 924). 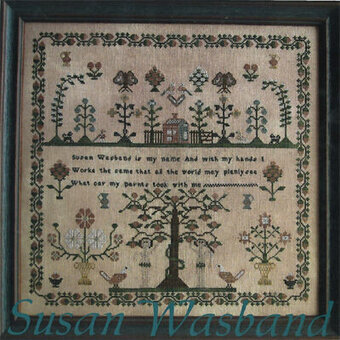 Stitch Count: 113W x 73H. 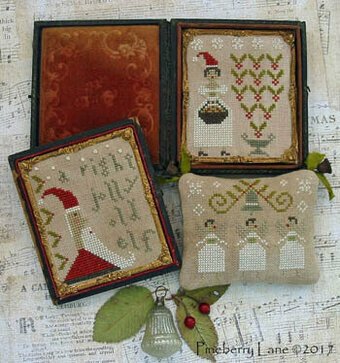 "The Christmas witch she loved to stitch. 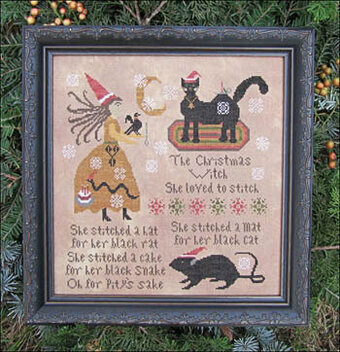 She stitched a hat for her black rat, she stitched a cake for her black snake. 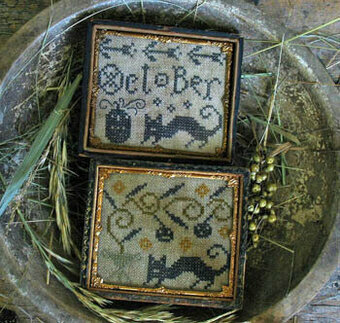 Oh for pity's sake, she stitched a mat for her black cat." 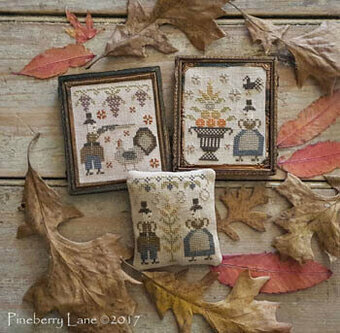 Model stitched over 2 threads on 40 Ct. Vintage Autumn Gold by Lakeside Linens with DMC floss and Gentle Art Sampler threads. 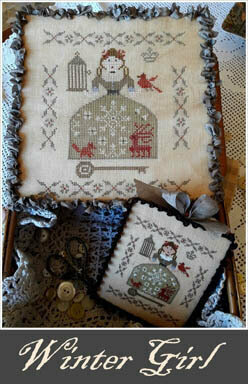 Stitch Count: 162W x 168H. 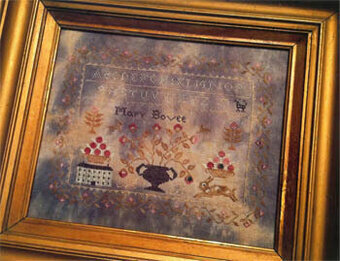 Model stitched on 36 Ct. Natural Edinburgh linen over two using Gentle Art Sampler threads. 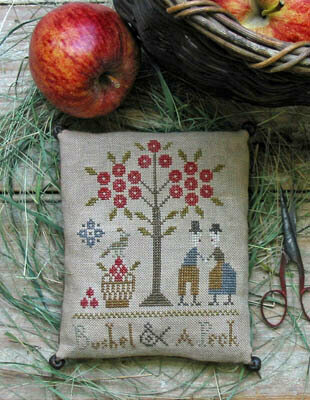 Stitch count 82x82. 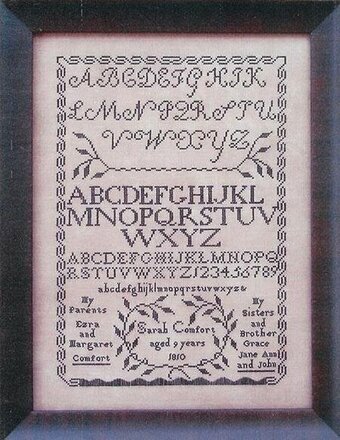 Approximate size 5 1/2" x 5". 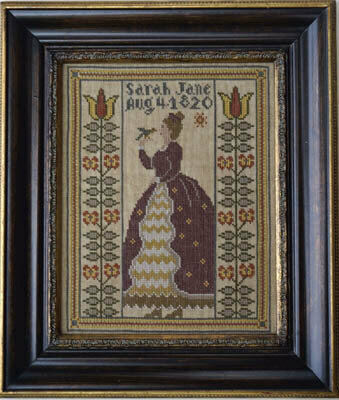 Model stitched on 32 Ct. Country French Golden Needle linen using DMC floss. 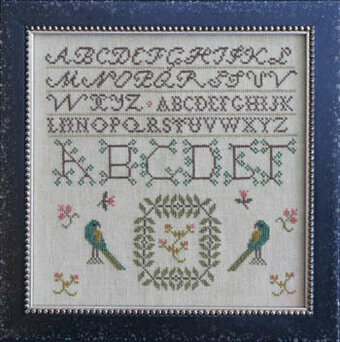 Stitch count 87x94. 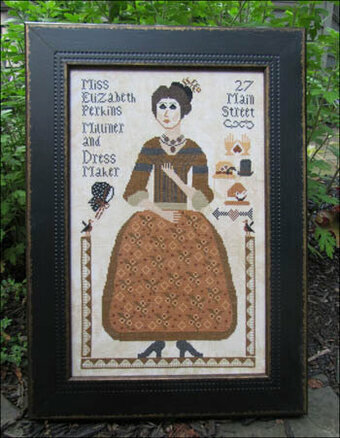 "Miss Elizabeth Perkins Milliner and Dress Maker. 27 Main Street." 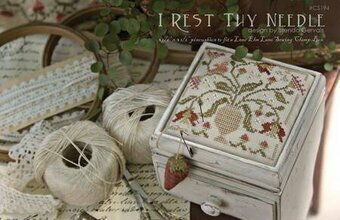 Model stitched over two threads on 40 Ct. Doubloon linen by Picture this Plus with DMC floss. 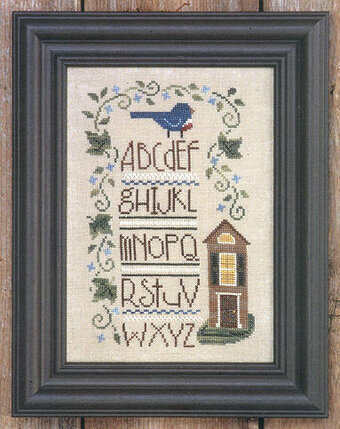 Stitch count 141x222. 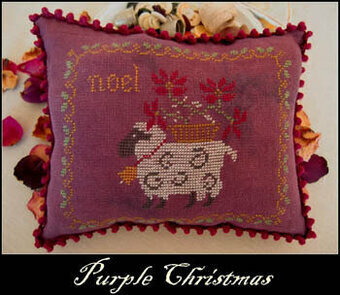 Model stitched on 32 Ct. Purple linen by Nikyscreations using DMC floss. Approximate size 8"x8". 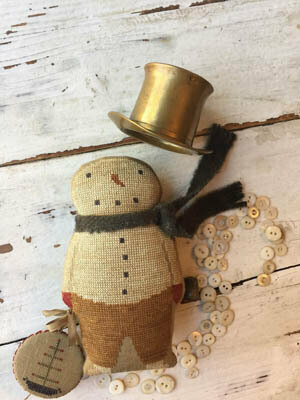 Model stitched on 36 Ct. Legacy Linen by Picture this Plus with Weeks Dye Works, Gentle Art Sampler threads, Classic Colorworks & Valdani floss. 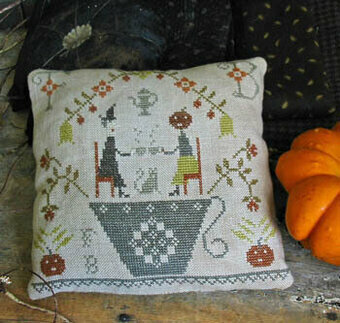 Stitch Count: 133x97. Color chart. 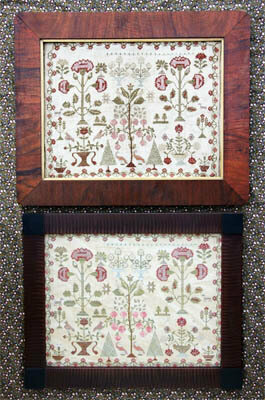 Also required, but not listed above, Valdani floss Antique Gold Medium and Antique Gold Dark. 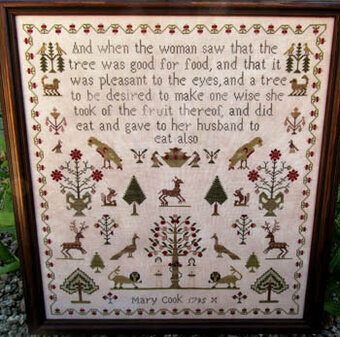 Mostly worked in cross stitches, there are also eyelets and a few bullion knots, with the Lord's Prayer and Apostle's Creed worked over one thread. 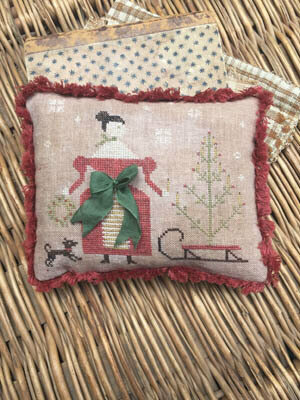 Model stitched on 32 Ct. Lentil Linen with Gentle Art Sampler threads and Weeks Dye Works floss. 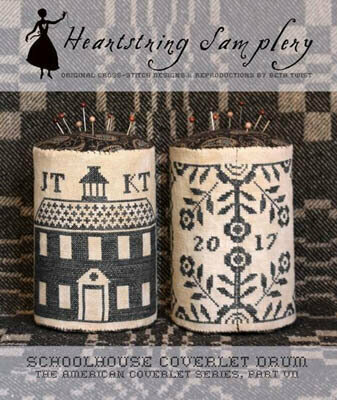 Stitch Count: 233 x 211 (DMC alternates are 437 422 3828 3799 3864 3051 223-2skeins 613 ecru 3354 598 3328-2skeins 3688-2skeins 304-3skeins 400 975 167 611 927 3024 869 (372 3011 3012 all 3 need 2 skeins) 371-3skeins) NOTE: if using different count fabric, you will need to adjust the amounts of threads. 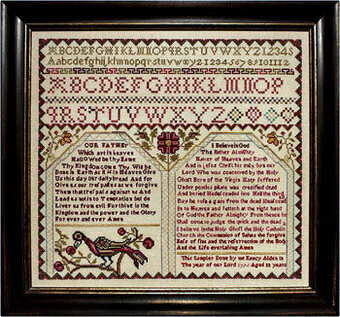 Model stitched on 30 Ct. Parchment by Weeks Dye Works over two using Gentle Arts Sampler threads, Weeks Dye Works floss, and DMC floss (or all DMC 3047,841, 452, 3772, 3773, 317, 414, 3052) Stitch Count: 134W x 66H. Alphabet provided for personalization. Model stitched on 36 Ct. Confederate Grey using Week Dye Works floss. 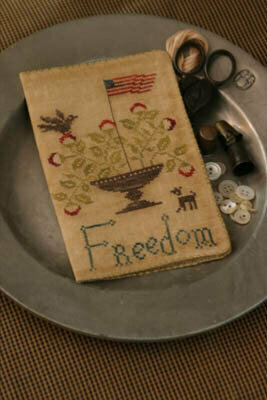 Stitch count for pinkeep is 125x105. 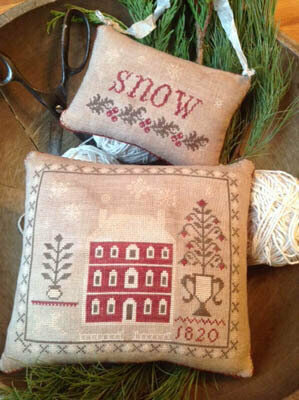 Stitch count for Ornament is 84x47. 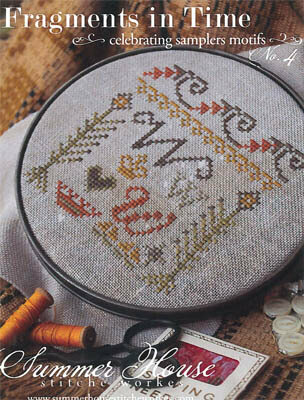 Model stitched on 35 Ct. Espresso linen by R&R Reproductions with Gentle Art Sampler threads (or DMC 310,647,730,781, 829,834, 975, 646, 3023, 640, 832, Ecru, 3012). 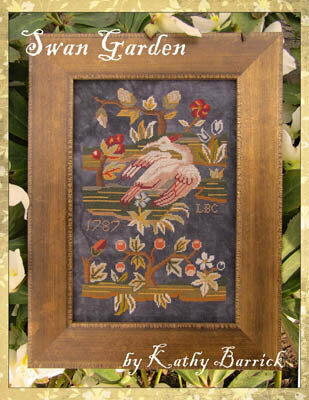 Stitch Count: 71W x 66H. 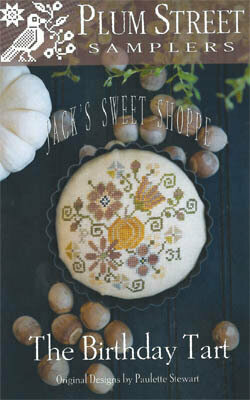 Design shown finished in a 4.75" mini tart pan. 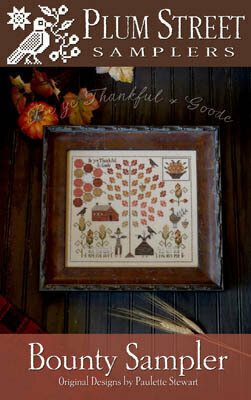 "Be Ye Thankful and Good." 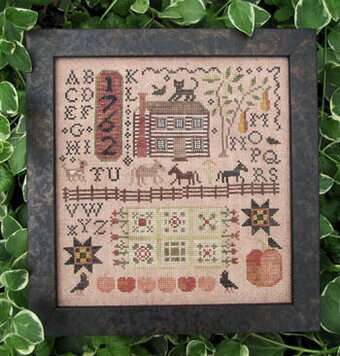 Model stitched on 36 Ct. Stars Hollow Blend by R&R Reproductions with Classic Colorworks, Gentle Art Sampler threads, and Weeks Dye Works floss (or DMC 300,301, 435, 437, 822,919, 3011,3371, 3781, 3782, 3787). 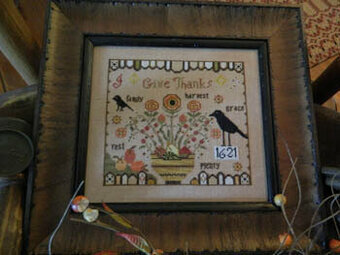 Stitch Count: 161W x 139H. 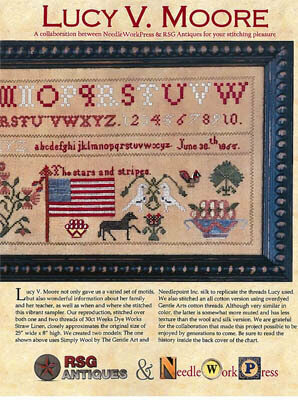 Model is stitched on 32 Ct. 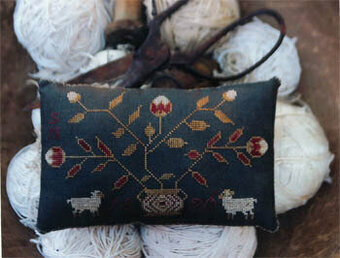 Straw linen by Weeks Dye Works using one strand over two of Needlepoint Silk. 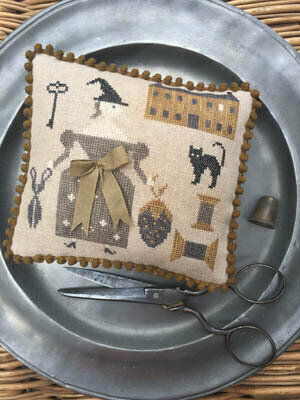 Model stitched on 32 Ct. Charcoal Gray Belfast linen with Gentle Art Sampler threads. 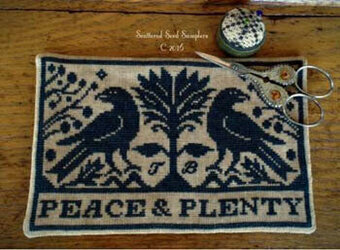 Stitch Count: 115x70.